Well it’s Week 2 of my Summer Book Giveaway! Congrats to Kim and Michelle, who won free copies of Marlena Graves’ A Beautiful Disaster! 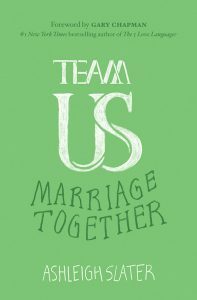 This week I am so excited to give away one copy of Ashleigh Slater’s new book Team Us: Marriage Together. I have to tell you, one of the reasons Ashleigh will always hold a special place in my heart is that she was one of the first people to take a chance on my writing. 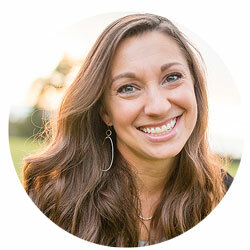 She founded the website Ungrind, where you can find lots of awesome encouragement for women, and that was one of the first places where I was a regular contributor. Ashleigh is also a wife and mother of 4 gorgeous girls, so she knows of what she writes! 1. As I’m sure you know, there are a LOT of marriage books for Christians. With all the resources out there, what compelled you to write Team Us, and how is it different from other books on marriage? I personally think there are two things that differentiate Team Us from other marriage books. One, while I have been married for nearly twelve years, I’m not an expert on marriage, and I don’t present myself as one. Rather, as one reviewer wrote about the book – and I loved – I’m “still deep in the trenches of a fairly young marriage, raising small children, and navigating this crazy thing called commitment.” And that’s the vantage point I write from – as someone who’s right there with you, or maybe a step ahead or behind – going through the ups and downs of marriage. Two, it’s story-driven and conversational to the point that most people who’ve read it comment that it’s like sitting down and talking over coffee. That’s something I really wanted with this book. I didn’t want readers to feel like I was talking at them, but with them. 2. The image of marriage as a “team” is a central theme in your book. Why is it important for married couples to think of themselves as a team? Whether it’s in sports or the office or even a show like The Amazing Race, members of a winning team are for each other. They work together in order to succeed. And I believe that’s vital to marriage. One of the reasons Ted and I got married was because we believed God could use the joining of our lives in a unique way for His glory; that we’d be better together. That’s more likely to be our reality if we are united, determined to do what it takes to face life and its challenges side-by-side, rather than back-to-back. 3. What are some of the qualities of a good team? I’m not much of a sports enthusiast, but in the book I do compare marriage to a sport I find intriguing: curling. As I compared marriage to curling, three things stood out to me. One, strategy. Curling is nicknamed “chess on ice.” It may seem like this odd game with brooms, but there’s a ton of strategy involved and it’s fascinating. Marriage also benefits from strategy. A good team creates a game plan for what they want to accomplish. How they hope their relationship develops and where they want it to end up. Two, intentionality. In curling, the members of the team have to be intentional in order to get the stone into the house. In marriage, it takes being intentional to move in the direction of those strategic goals of how you want your relationship to play out. Intentional couples make today’s decisions with a long-term perspective. Three – and perhaps most importantly – grace. In curling there are players called sweepers. With those brooms, they help direct the stone into the house after it’s been slid. Strategy and intentionality are the “meat” and “potatoes,” grace is like the “secret sauce.” While strategy and intentionality set a marriage off in the right direction, it’s grace that sweeps it toward that heavenward path. It’s what brings you through the hard seasons united. 4. Who do you hope will read this book? Is it only for married couples? I specifically wrote it for married couples in their first ten years of marriage, as well as for engaged couples. But as I’m getting feedback on Team Us, I’m discovering that it’s also resonating with individuals who are in dating relationships, as well as couples who’ve been married for decades. And while I didn’t write the book with marriages in crisis in mind, I’m friends with a couple who have been considering separation and even possibly divorce. They decided to go through my book and said it’s sparking good, much-needed discussion. So my hope is that no matter what stage of relationship a reader might be in – from dating to married for years – that the book will encourage them and their loved one to grow together. This week I am giving away one free copy of Team Us! To enter for a chance to win, share a comment about your own experience of marriage as teamwork: Is this an image that resonates with you? How has teamwork served your marriage? What has threatened your unity as a team? Or what have you done to strengthen your teamwork? It is very much an issue that resonates with me. God made marriage so that we can be a team. It’s very much an issue that resonates me and an essential part of marriage. Not only does working as a team mean we are growing and learning together but being a team in marriage reflects the triune nature of God. Definitely resonates with me. Marriage is totally about being a team-helping one another, and working towards common goals. I’m only 8 months in to this marriage thing, and I’m thankful that someone told me long ago to view marriage as “us against the problem” rather than “me against him.” We haven’t had any huge battles yet, but we’re facing a significant transition from seminary to whatever’s next. This is the first time I’ve had a big decision to make as “we” rather than “me,” and I’m glad Chris is my teammate. Being a couple under 30 with 3 children and one on the way means we really have to work together. Teamwork is vital. I’m so thankful for a husband who reminds me often that “we’re on the same team.” Sadly, I’m so quick to be defensive, assume poorly, or get into jump-off-the-cliff mode, and he so graciously reels me back in . He reminds me that we’re together in whatever the issue is and I need to retreat my defensive position. I’m thankful for this reminder all too often. This looks like such a useful resource! I can see how even as an engaged couple how often teamwork comes into play. We talk a lot about what that means to us as a future married couple. And my fiance’s name is Ted too! Thanks for sharing this! One huge thing in our marriage that has helped us stay on the same team is praying together at least twice a day and daily confessing to each other about our struggles. It helps us get in a habit of forgiveness and understanding that we both need grace daily, and that we’re on this journey together. This may come as a surprise that I would comment hoping for a copy of the book when I have been married for almost 50 years! I can’t believe it either. We have made it through the adjustments of raising 4 kids and walking out life together. Through thick and thin the attitude was for us, life together with Christ as our guide! There was no turning back after our vows. We were determined to follow Him and stay together working through anything. Commitment for us meant no turning away from what was in front of us. We did become a TEAM! Most times we can conquer anything without words…just both doing what needs to be done and feeling a sense of gratitude when it has been accomplished. No pride can live in this enviornment, just two humble people doing what it takes to bring peace and happiness to life. Now at 71 and 69 we try to help anyone who is struggling and help them find the path to real love … Christ at the center. He makes us whole one day at a time! Hi Sharon! I always love reading your blog, and love the book recommendations you make. This one looks fantastic. I got married in March, and am new to the marriage game… this book is something that sounds like an awesome resource to help shape our marriage as my husband and I begin to navigate our life together as a team. God is really teaching me about grace right now, and I am eager to read about this as it relates to marriage! During our 26 years of marriage we have raised a daughter, lost children and loved ones, suffered a job loss and major illnesses and become the caregiver for a parent. All of this would have been so much more difficult without our teamwork. My husband and I actively communicate and believe that each of us coming together as a team is what makes our marriage work. And we just became a parenting team last year as well. Hi Sharon! Long time!! I’m so excited for you and Ike (Issac too!) in your big move back south! So, this book looks great I’d I’d love a copy. I’m recently engaged and would love any counsel on what I’m getting myself into come September 27th. I know the Lord has much to continue to work out in me (and my sweet fiance, David) through marriage, and I’m so looking forward to what this beautiful depiction of the gospel holds for us!! Blessings to you and your family, hope to see you sometime soon! I am so thankful to have found your blog. I would love to win a copy of “Team Us: Marriage Together”. My husband and I will be married for 1 year on Saturday, and what a year it has been. Between him joining the Army, getting stationed in Alaska, leaving all of our family and friends, and losing 2 babies, this year has been quite the learning experience. One thing we constantly discuss is how all of these things have the potential to make us stronger as a team. I would love to read this book and learn more about how our marriage can make us a better team as husband and wife, and eventually as parents! Congratulations to Melissa Seng, who won the book giveaway! And thanks to everyone who entered! Stay tuned for more summer book giveaways!